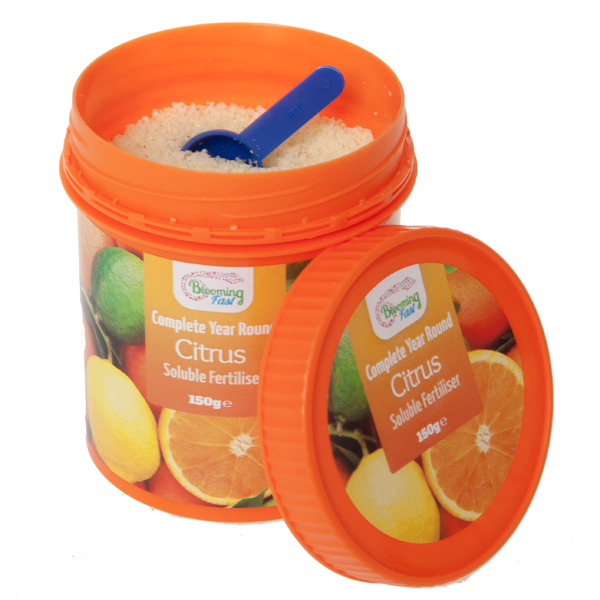 We have created this formulated Citrus feed to deliver the correct year round balance of both major nutrients like nitrogen, potassium and phosphorous whilst containing all the essential micronutrients that citrus are so needy of like magnesium and boron. This high potency feed is easily made up in a watering can or small container, using the scoop provided, and will last for well over a year on 2 of our citrus trees. Supplied as 150g re-sealable tub. Specification: Supplied as a 150g resealable tub. Your order will be dispatched within 3-5 working days. Most deliveries require someone to accept and sign for the delivery to ensure the goods are received correctly. To help you we can arrange for delivery to be made elsewhere. Click here for more information. We hope you like your purchase, however, if you are not entirely satisfied with any item, it can be sent back to us for a refund, provided it is returned within 14 days after delivery has been made (unless otherwise specified). Please click here for more information. Ordered items are usually despatched within 3 to 5 working days. Living Plants and some Large Furniture Items, please allow up to 7-10 working days for delivery. Majority of items can be delivered to all UK postcodes, there may be some postcode exclusions, please read the product description or below link for further details. Returns for a refund or exchange made easy with Asda's amazing 'toyou' service. Ideal World special offers are only available for a limited time, previously recorded videos may contain pricing, exclusivity claims or promotional offers that have expired.